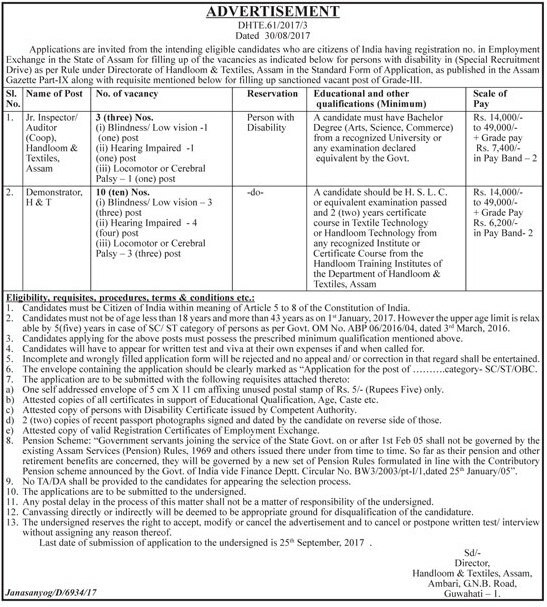 Applications are invited for HSLC and Graduate Jobs in Handloom & Textiles, Assam Recruitment 2017 from the intending eligible candidates who are citizens of India. as per Rule under Directorate of Handloom & Textiles, Assam. Application should be done in the Standard Form of Application, as published in the Assam Gazette Part-IX along with requisite mentioned below for filling up sanctioned vacant post of Grade-III. 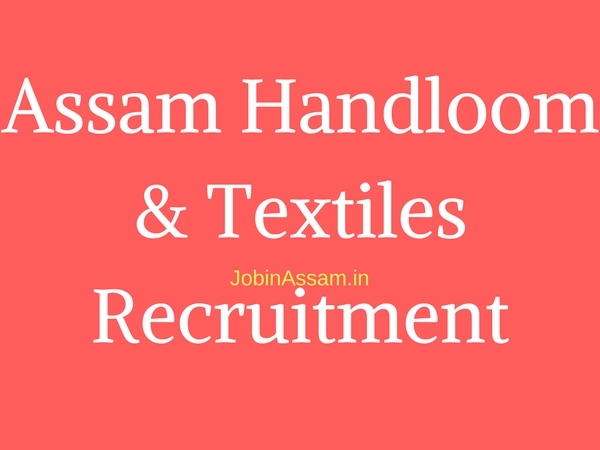 You can apply for this Handloom & Textiles, Assam Recruitment 2017 if you are a graduate or you have passed HSLC. Details is given in the below part. Pay scale: Rs. 14,000/- to 49,000/- Rs. 7,400/- in Pay Band–2. Pay Scale: Rs. 14,000/- to 49,000/- + Grade Pay Rs. 6,200/- in Pay Band- 2. Candidates must be Citizen of India within meaning of Article 5 to 8 of the Constitution of India. Candidates must not be of age less than 18 years and more than 43 years as on 1st January, 2017. However the upper age limit is relaxable by 5(five) years in case of SC/ ST category of persons as per Govt. OM No. ABP 06/2016/04, dated 3rd March, 2016. Candidates applying for the above posts must possess the prescribed minimum qualification mentioned above. Candidates will have to appear for written test and viva at their own expenses if and when called for. Incomplete and wrongly filled application form will be rejected and no appeal and/ or correction in that regard shall be entertained. The envelope containing the application should be clearly marked as "Application for the post of .................... category- SC/ST/OBC. If you are interested in Jobs in Handloom & Textiles, Assam, please download the official advertisement from here. No TA/DA shall be provided to the candidates for appearing the selection process. The applications are to be submitted to the undersigned. Any postal delay in the process of this matter shall not be a matter of responsibility of the undersigned. Canvassing directly or indirectly will be deemed to be appropriate ground for disqualification of the candidature. The undersigned reserves the right to accept, modify or cancel the advertisement and to cancel or postpone written test/ interview without assigning any reason thereof.